We had just gotten back from lunch, when my lovely supervisor sidled up to my desk. I didn’t think I was missing a meeting, and she didn’t seem stressed or worried. If anything, there was a sneaky, playful feeling. Were we going to hide in the air conditioning, away from the sweltering staff room? Now I knew something was up. When I got there, it was indeed set up for a small meeting, but one of my coworkers had brought these beauties along for snacks. Even though I didn’t have to participate in the meeting, I still got to choose my favorite. Have I mentioned that I love my job? They’re manjū, a kind of dumpling that’s pretty popular here. A bready, wheat-based outer layer is filled with sweet red bean paste. These are a great snack for when you’re hungry and want something sweet but not cloying. I decided to go with Tama-tan, the mascot of Tamamura town. My coworkers were pretty surprised that I could recognize all of the characters, particularly Otomi-chan, but it’s safe to say I can recognize Tomioka’s mascot pretty well! It’s nearing the end of summer vacation, and people are bringing lots of sweet omiyage back from their trips. I love the treats from far away, but this Gunma specialty really made my day! Aren’t they adorable? If you want to read more sweet stories from my daily life, try The Sweetest Thing and A Very Merry Unbirthday. And as always, be sure to follow along on Twitter, Tumblr and Facebook! 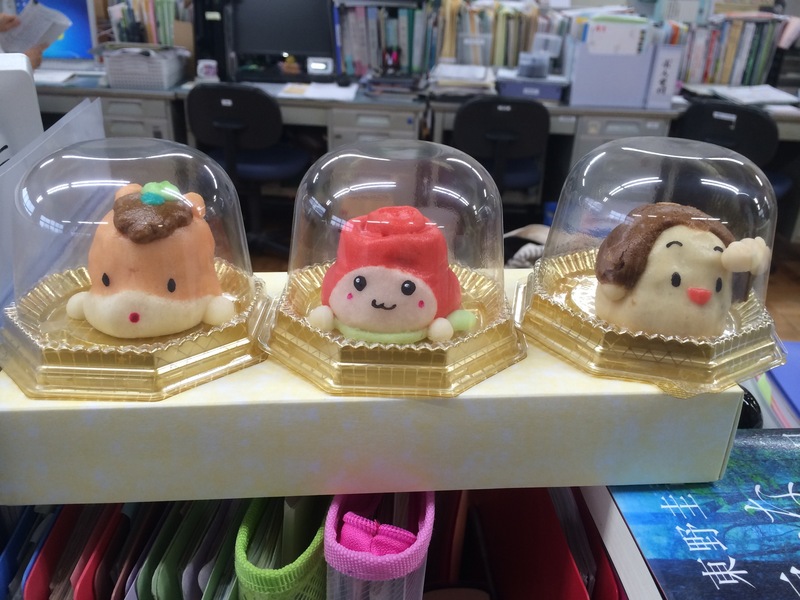 This entry was posted in Food!, Gunma, Japan, School Life, Uncategorized and tagged Gunma, Gunma chan, Japan, Japanese, manju, omiyage, otomi chan, snack, sweet, tama tan, yurukyara. Bookmark the permalink. 1 Response to Gunma-chan Manjū!